Tyler Cloud, raised in Virginia; admitted to the South Carolina Bar in November of 2017. He went to Hampden-Sydney College and graduated in 2014 with a B.A. in Foreign Affairs and a minor in History with a study abroad program in Spain. 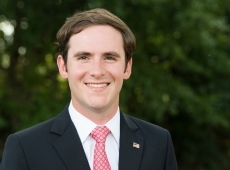 He graduated from Elon University School of Law in 2017 where he was an Oaks Scholar and served as a Production Editor on the Elon Law Review. He began working in the legal field as a summer intern at the Carroll County Commonwealth Attorney's Office in Hillsville, VA during his summers off during college. After his first year of law school he was a judicial intern/law clerk for the Hon. Brett L. Geisler of the 27th Judicial Circuit of Virginia. After his second year he made his way to Charleston where he worked as a summer associate for the Hayes Law Firm, a plaintiff's construction defect litigation and insurance bad faith litigation firm handling large class action cases throughout the state. During his third year at Elon he got his third year practice certificate for North Carolina and worked as a Student Attorney at the Elon Small Business and Entrepreneurship Clinic assisting clients in drafting operating agreements, articles of incorporation, service agreements, liability waivers and other transactional matters. After taking the bar he returned to the Hayes Law Firm as an associate where he worked until joining Clawson and Staubes in 2018. He grew up on a family owned cattle farm in Virginia where most of his family lives. Hobbies include shooting sports, hunting, fishing, playing golf, skiing in the winter, traveling, and generally anything related to the outdoors. He is also a die-hard Carolina Panthers fan.